Bacchy and Debs swung by our place on Thursday afternoon. Bacchy’s finely crafted plan involved me joining them for a departure just before the Foxhunters so the three of us could hook up with their friends in Altrincham. From there to the races the next day. I had never been to Aintree before and it had been years since Bacchy’s last appearance. The trip had its roots in a drunken conversation in the Mow during a Christmas drink. How many similar aspirations never even make it out of the pub door? So there was cause for smugness as we sat in our back garden, lapping up the Spring rays and contemplating a decent opening day card. My lumpy forehead, courtesy of a losing altercation with an intransigent Whitstable door, was a last minute scare. But the tennis ball on my left temple was receding by the hour. We caught the majority of the action between the bookies and the telly, whilst Debs and Mrs A hit the hostelries. Silviniaco Conti was brave in the Betfred Bowl, confirming, if further proof was needed, that Cheltenham is not his track. The Aintree Hurdle was disappointing. Arctic Fire looked booked for a comfortable win before Ruby took a tumble at the last, a la Annie Power. It denied us one last battle between this generation’s pre-eminent jockeys. McCoy aboard Jezki was left to coast home unopposed. The Foxhunters rolled around and no sign of the girls. We watched Nina Carberry complete an impressive Cheltenham-Aintree foxhunters double aboard On The Fringe. She may only one way of riding, but it is very effective. We bombed up to Altrincham in Bacchy’s new, low-slung saloon, accompanied by The The and Neil Young. The late departure was very squarely blamed on the ladies’ overdue return from the pub. I was only marginally maudlin about the fate of my day’s race selections. Three of them hit the bar, the last of which, I learned as we circumvented Bicester, was chinned in the big handicap of the day. Call The Cops owes me nowt, though. There was time at Bacchy and Deb’s mates for a couple of beers before heading out for some grub. Jules and Mark took us to a restaurant where The Real Wives of Cheshire is filmed. Finally, credibility with my teenage daughters! The jokes were that this part of Cheshire is known as Orange County, such is the demand for spray-tan studios. Mark informed me that we were in Hale, not Altrincham. One of the richest and most desirable areas in Manchester. Mark had been in advertising. He told me that he didn’t know Pickering, my home town, but knew Malton down the road because it had a billboard-sized advertising hoarding on the A64. “I know ‘em all mate. I know ‘em all.” I didn’t doubt it. He knew his stuff, talked a million miles an hour and repeated everything. Everything. Wayne Rooney is an occasional visitor to The Railway for a game of darts. This excellent boozer where we rounded off the evening has a traditional local feel and, rather pleasingly, sits awkwardly with the swish wine bars, double fronted antiques shops and million-pound estate agents down the high street. Refreshing. Over a couple of nightcaps, Bacchy’s defence about his non-appearance at Cheltenham this year almost began to unravel. Debs pointed an accusing finger and asserted that Bacchy hadn’t even asked for the time off until far too late; and that next year he should follow due process and put in formal leave request. There was much humorous scoffing on both sides, but then Debs showed her real hand. “How does it look if I let my husband go to the races and gamble irresponsibly when he is the business manager at the school where I am the head teacher…?” There’s the bottom line. Font size 24, bold, underline and italics. He needs a new job. Bacchy had been toying with the idea of driving to the track until Mark set him straight. “No, you gotta see the sights on the train up to Aintree. Top entertainment. Top entertainment.” The public transport plan sounded convoluted but workable. Either side some studious web-based punting, there was even time for a rather fine bacon and tomato flaky pastry wrap from the superior bakers on Hale High Street. You don’t quality like that in Altrincham. Mark’s scheduling was spot on. We were at Liverpool Central in bags of time. The platform was crammed with eye-popping distractions. Aintree executives had discouraged the press from taking unflattering photos of Ladies Day scenes out of ‘respect for all our racegoers’. Snappers have had a field day over the years posting pics of brassy Scouse lasses in skimpy dresses, tottering on mega-heels and engaging in unrestrained behaviour. The racecourse was keen to claw back some integrity, though Alastair Darling in that morning’s RP was in forgiving mood and was celebrating this proud City’s desire to show off and put on a proper party. The Radio Mersey stand was belting out some furious dance beats and the DJ was giving away free flip-flops from giant piles in front of the speakers. “Ladies. Never mind those heels. Try our flip flops! Come to the races and save your souls!” That’s what I call a pitch. We hooked up with Mark’s crowd in the KFC. They’d got a minibus up from Lancaster that morning and had already made a steady start on the ale. This was an annual fixture for Mark’s squad and we left them in their usual berth by the two-furlong pole to recce the track for ourselves. Navigating the Cheltenham Festival logistics is all well and good with 15-odd years’ experience to draw on, but Aintree was a whole other ball game. Finding somewhere to watch the racing and grab a pint was a challenge. 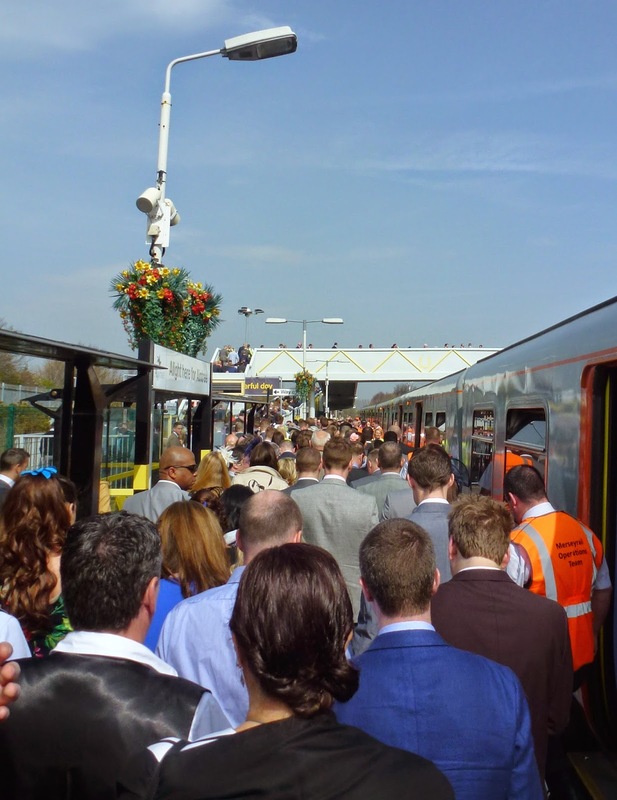 40,000 punters were squeezed in to a strip from the turn after the winning post back passed Mark’s gang to temporary stands way up by the three-furlong pin. Three new grandstands clustered around the bend. We gazed enviously up to galleried lounges filled with smart-suited types taking in great views through floor-to-ceiling windows over the parade ring. Checking out the runners for the first, we overheard a Burberry-clad Southerner mutter, “It’s not like Cheltenham is it?” Spot on. Though everything we saw was honest, good natured and well meant. Loud, yes. In yer face, yes. But as far as lairy behaviour goes, nothing tops my only experience of Royal Ascot one hot Summer before the redevelopment, where the scenes were a lot more like Geordie Shore meets Ex On The Beach than Made In Chelsea. Binky wouldn’t have known where to look. As the races unfolded, we found the best place to stand was at the top of the concrete embankment about half a furlong out, next to the parties and picnickers who hadn’t seen a horse in the flesh all afternoon. My only winner of the day was a good one: Malcolm Jefferson’s Cyrus Darius pulled well away in the Top Novice Hurdle. Quite how strong a renewal this was is open to question with the unconvincing Vago Collonges back in 2nd. But Cyrus will be chasing next year and went straight on my list anyway. I had half an eye on the Twelve to Follow all day and when Saphir Du Rheu won the novice chase in commanding style, I was back in front and feeling confident. The showpiece of the day was a competitive looking Melling Chase with a host of multiple Grade 1 winners stacking the card. Don Cossack made a mockery of all that with some big jumping and ran away from the toiling pack. Both my fancies fell. Sire De Grugy has not been the same horse this season came to grief at the ditch. Balder Succes, tragically, had to be put down the following day, unable to recover from the damage in his shoulder sustained in his tumble. Steve Ayres, the horse’s lad was distraught. “I really do feel I’ve lost my best friend" he said after he shared his grief on Twitter. Desperate stuff. That might have put my Twelve To Follow grief in to a more of a sober context, had I known. As it was, Don Cossack’s impressive win had put Bryn in charge. The game was up. Both selections I’d made for the two bonus races that day had been declared not runners. Pesky Whitstable wifi. The consumption of a foot long, luke warm, gritty hot dog with watery onions in a dissolving bread roll did nothing to lift my mood. Sam Whaley-Cohen steered Rajdhani Express to a victory that meant he became the winning-most jockey over the National fences. Not bad for an erudite amateur. ...and closing out the race. Bacchy was still winless. We both fancied Alpha Des Obeaux in the Sefton Novices Hurdle, and headed back to Mark’s pavilion to watch it. Turned out a couple of the other lads had fancied the big price about this Irish raider too. He was running a stonking race when headed by Thistlecrack coming to the last. Dickie Johnson aboard Alpha had galvanised his charge, as he so often does, and fired the horse into the final hurdle. And also as he so often does, he couldn’t get the horse back up again. When Alpha hit the deck in a heap, the air instantly turned blue with murderous expletives directed Johnson’s way. The horse was probably beaten, but our well-practised glower over pints of Crabbies (…yes, it had come to alcoholic ginger beer by then…) told you we would have liked to see him try. Barter Hill won the bumper well for small-time trainer Ben Pauling. Bellshill rolled up in second, I’m pleased to say. He had been tipped to Si and I by a steaming Dubliner in a pub toilet in Cheltenham and I’d let him go off unbacked here. At that point I made a hasty retreat to catch my connection home via Chester. Steve and Debs were spending another night and coming back the next day. Passing the Radio Mersey stand, I noted the piles of flip-flops and been decimated. Nearly every woman near me was wearing a pair, saving their souls, and taking their heels home slung around the straps of tiny handbags. The schedule was fairly tight but I made my transfer with a few minutes to spare. “On the Chester train. Cheers for organising a top day”, I texted Bacchy. His reply a few hours later suggested he had just crawled out of the pavilion after a few more sherberts with the Lancaster boys and was heading for a night in town. This was his photo posted on Facebook capturing some of the spirit of Ladies Day. 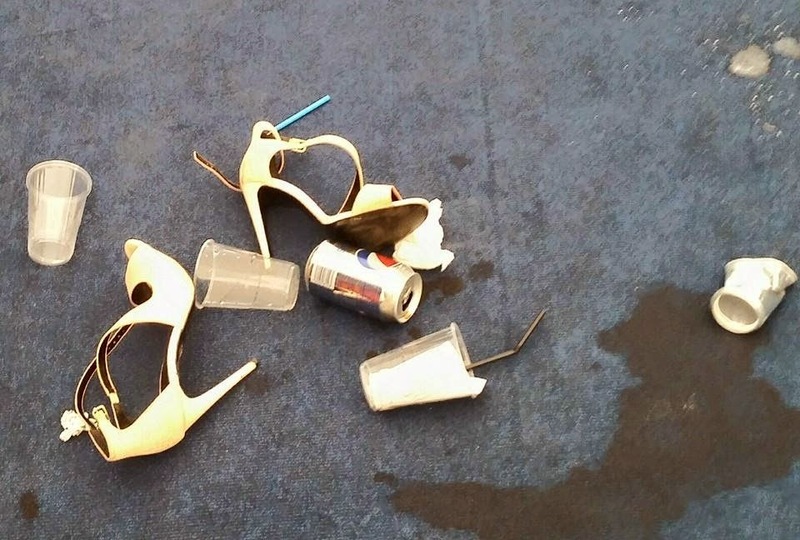 "Broken heels, bookies pens and drinks"
Superb. Who’s to say we won’t be back for more sport next year.